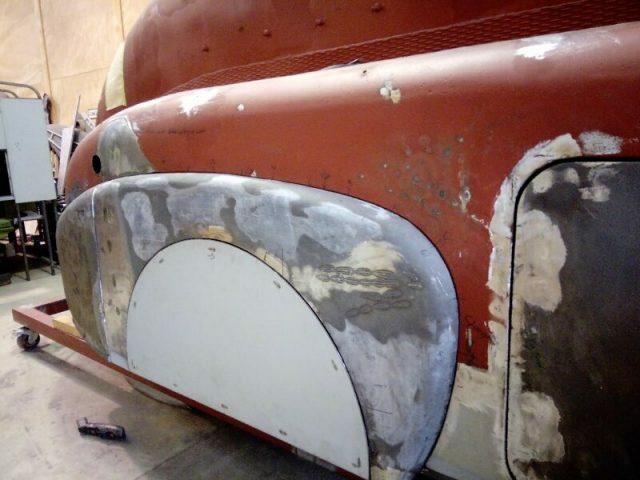 As the forward locker compartment doors were being fitted, it became evident that further work was required on the door skins. Taking a line of sight along the sides of the tanker, the doors appeared to bulge out slightly due to too much shape in them. This was caused in part by damage to the doors, and the outside edges being leaded to hold the skin to the frame. 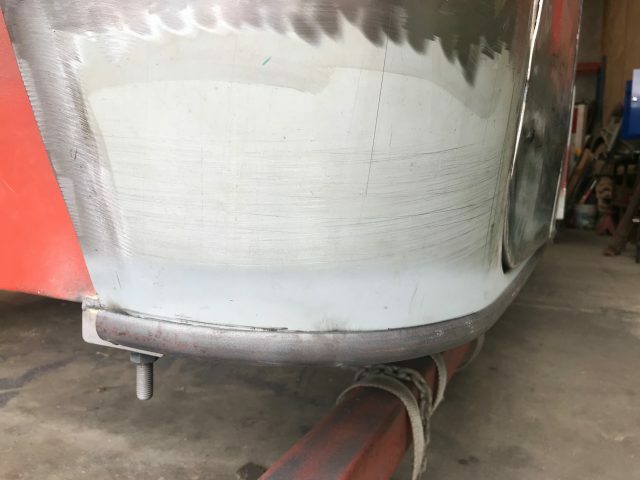 To achieve a clean line, the lead between the skin and frame on the edge of all four of the forward doors had to be entirely melted out. 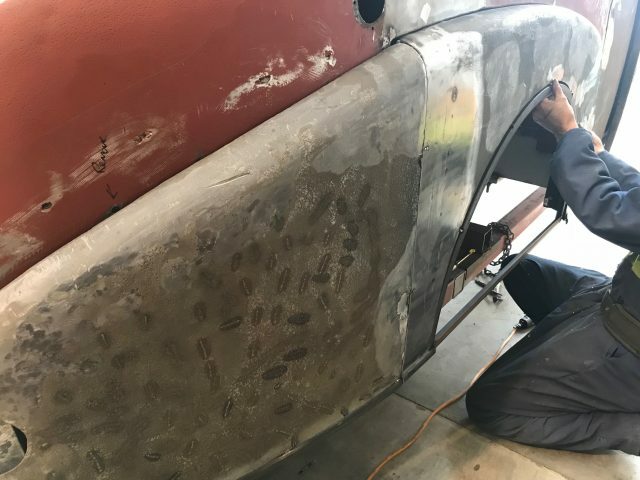 The process then involved shrinking the skin, drilling and plug welding through the skin to the frame, grinding the welds and hammering up the edges on the door frames. 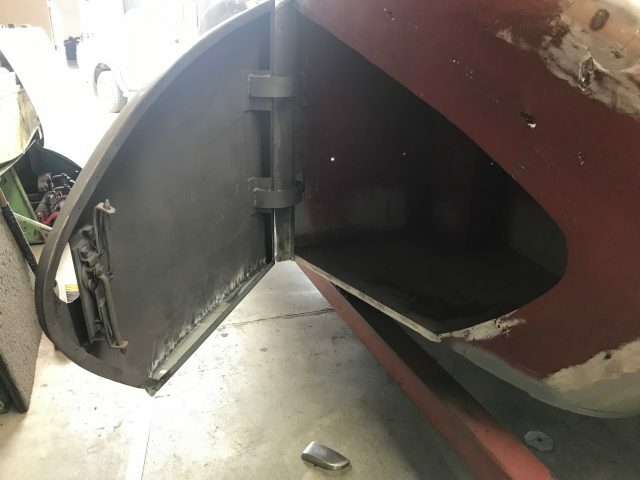 There has been a substantial amount of work in cutting, welding and reshaping all the locker compartment door hinges as most had been gas cut off the tanker. 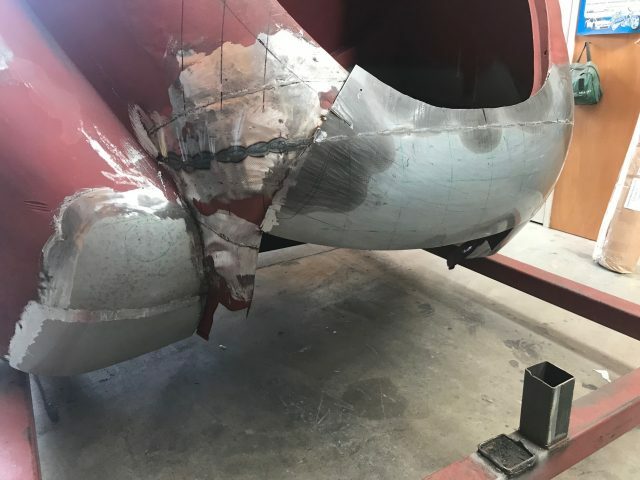 In addition to repairing the hinges, there has been significant repairs made to the hinge mounts and pillars due to metal fatigue and rust. 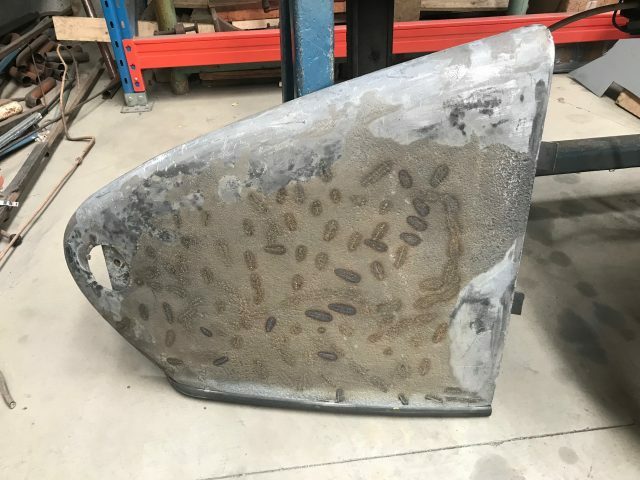 Work to repair the damage and deterioration on the right rear outer guard has involved melting out lead, and shrinking out all the damage and dents. 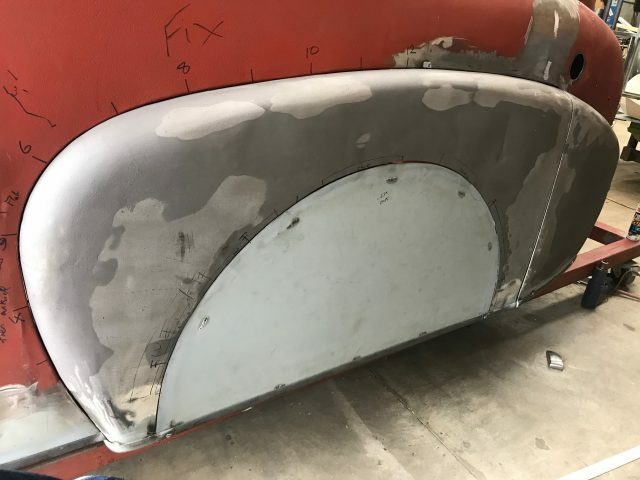 The right rear locker door had been gas cut off in the States and this resulted in damage to the edge of the rear outer guard. 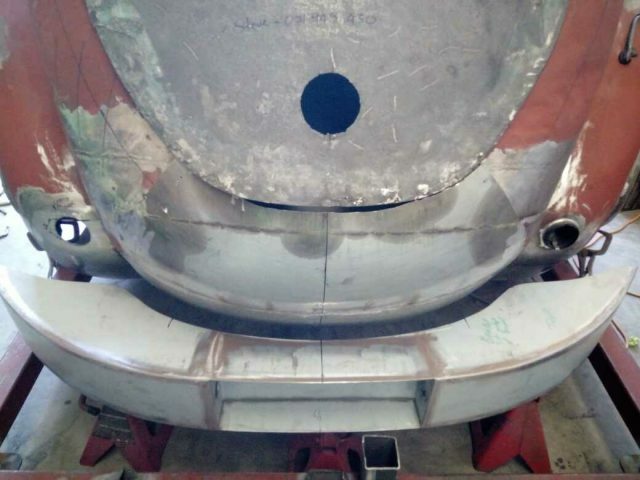 The inner frame sections were removed from the outer guard, and a new steel rear edge section was made up. 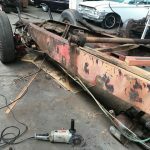 The frames, and the hinge mounting points, were repaired and then welded back in. 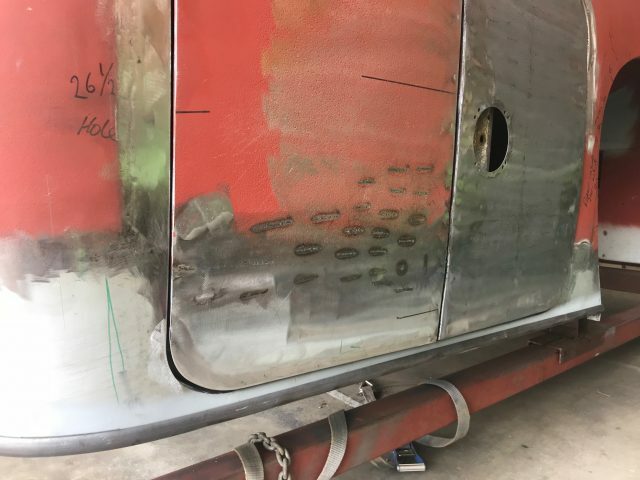 Shrink marks are evident on the right rear locker door, and the hole for the door handle can be seen on the left hand side. Access is gained to the multiple valve selector and bottom operator through this door. Lead was melted out around the left tail light area at the back of the rear guard. 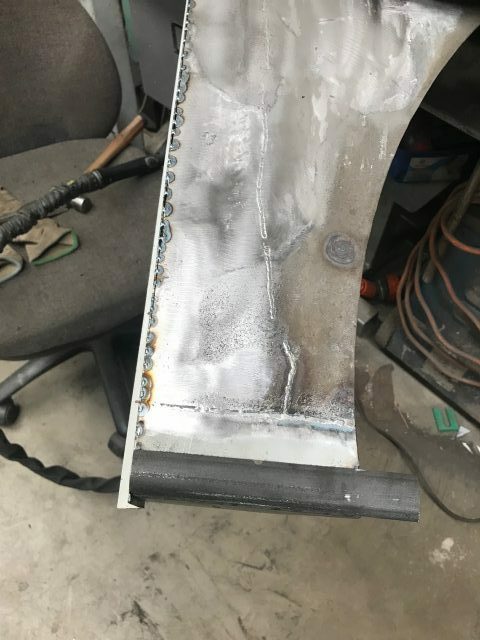 A new corner section for the tail light was made up and welded in place. 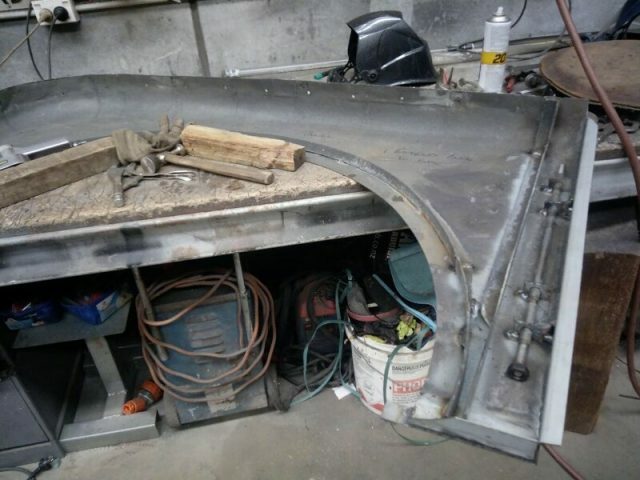 To complete the rear of the guard, a new lower section of steel was wheeled up and welded. 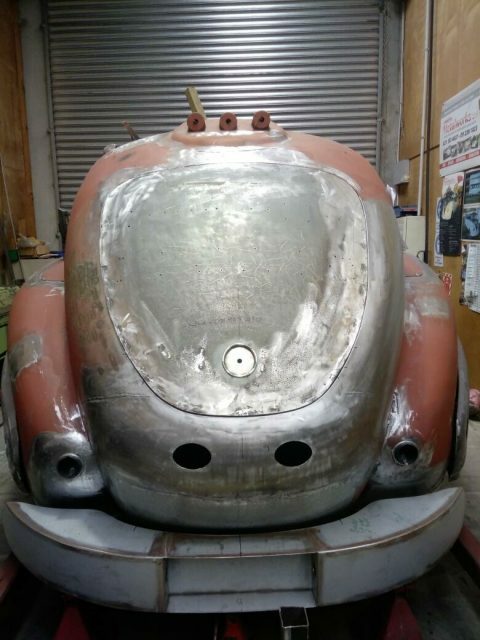 Simon then concentrated on finishing the shaping on the upper “bowl shaped” centre panel below the trunk lid. 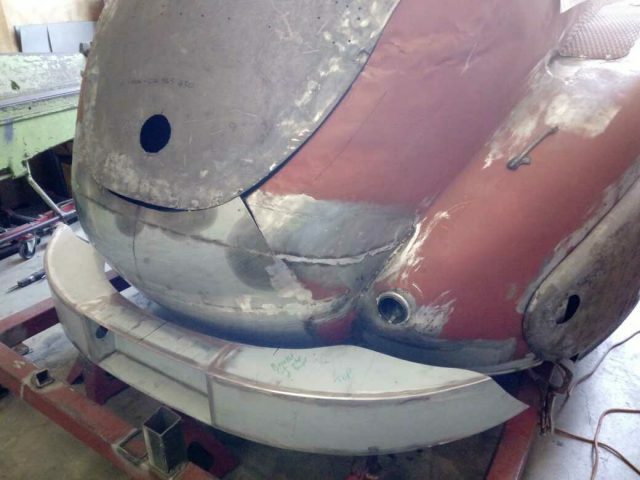 A hole for the left tail light was cut out and the tail light housing was welded into place. Simon used an English wheel to shape the new lower rear centre panel below the turn signal lights. The area to the right of the trunk lid had sustained damage from one (or several) of the rear impacts that had occurred over the years. 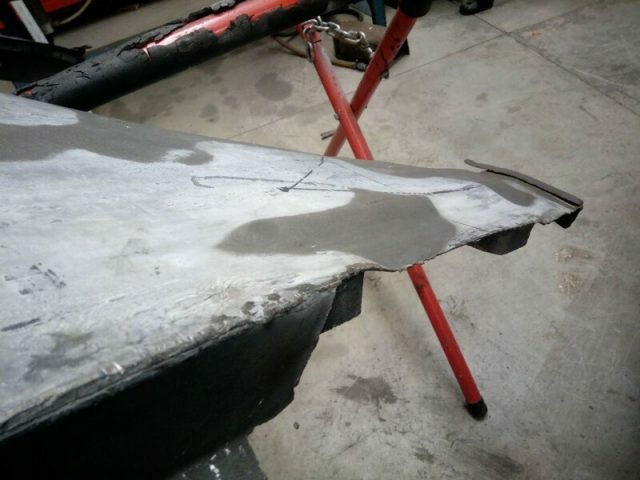 Simon cut the entire damaged area out and made up a steel repair section. 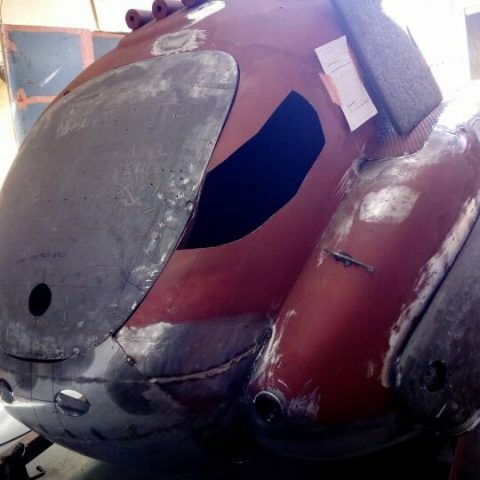 The repair section was welded back in to the right of the trunk lid and holes were cut in the upper centre panel for the turn signal lights. 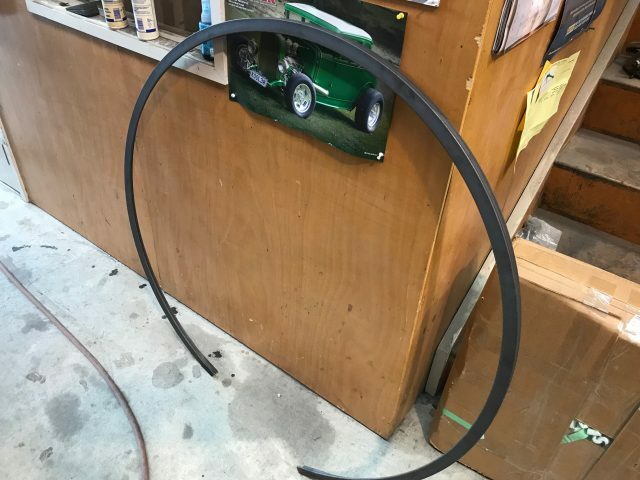 As well as all the remaining work to be done to finish the tanker, Steve also asked Simon to make some spats for the rear wheels. 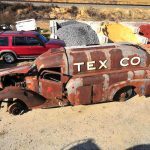 Spats are also referred to as fender skirts. They were factory produced from the thirties but are noted as being used as early as 1928 on a Stutz during a land speed record attempt. 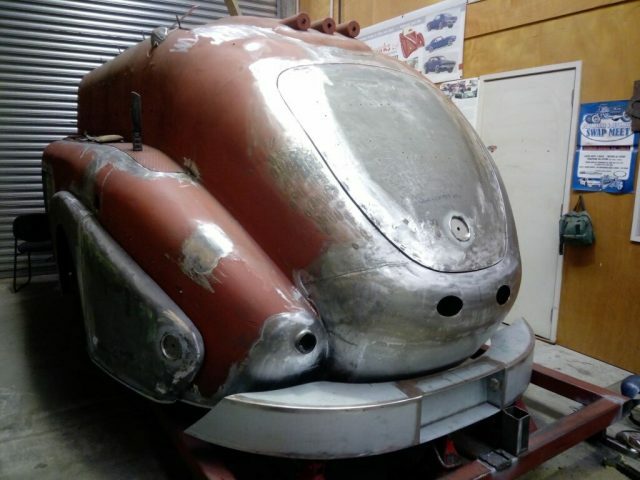 The benefit of these spats / fender skirts was to prevent air from entering the wheel arch, which in turn reduced the drag coefficient of the vehicle they were fitted to. It appears from promotional brochures that they were almost always used on the streamlined tankers and formed an important part of the aerodynamic design. 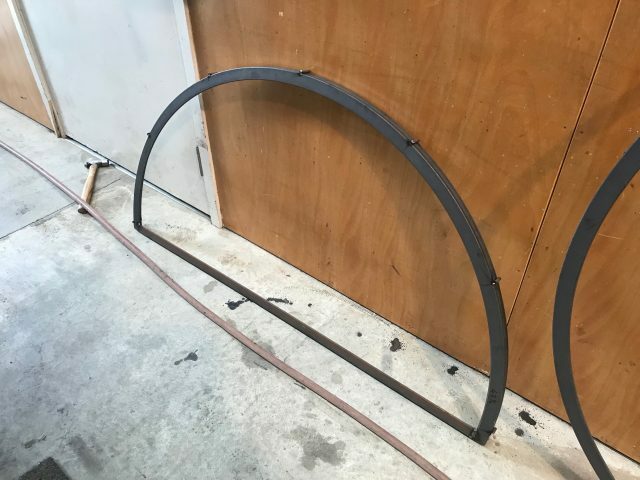 Steve asked Manukau Sheetmetals to roll up the steel angle that would be used for the spat frames. Creative Metal Works made up left and right rear spat frames to shape and support the skins, and attached mounting pins to the frames. 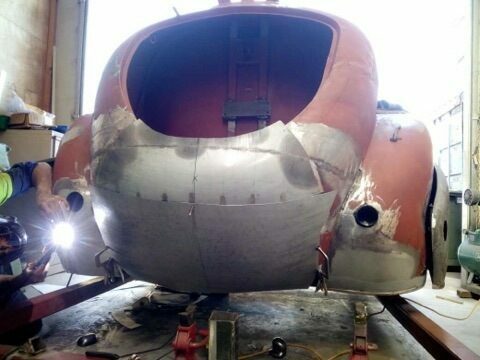 The spat frames were fitted and welded on to the rear outer guards. 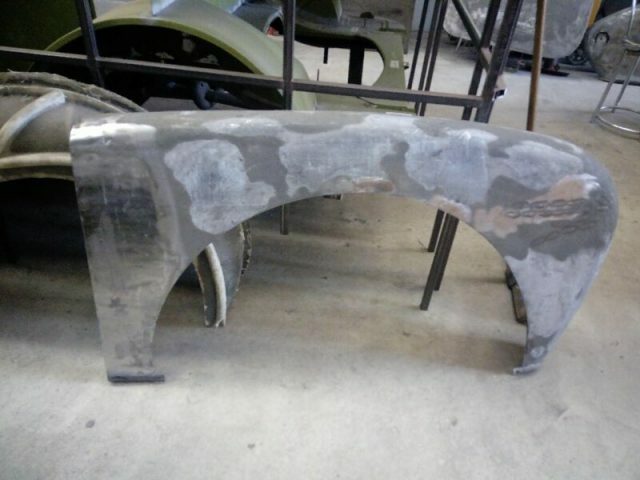 Custom-made skins were cut out and welded to the rear wheel spat frames. They are not permanently fixed to the outer guard and can be removed to gain access to the wheel and tyre. 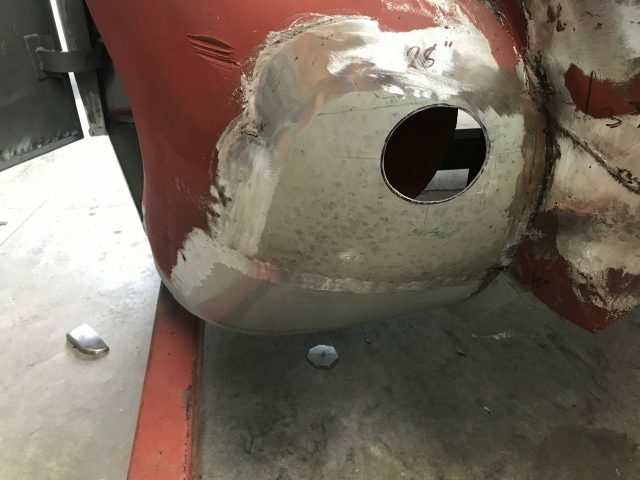 All of the rusty half round steel that remained on the tanker was cut off and the areas underneath cleaned up and treated. The replacement steel trim imported from the States was painstakingly rolled and formed prior to fitting. 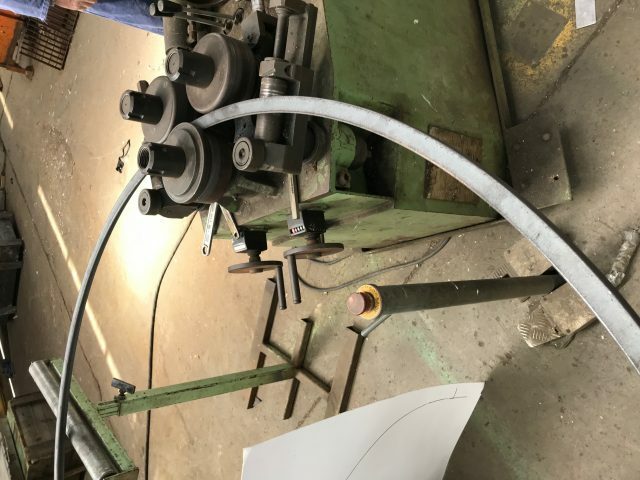 The steel had to be heated in order to bend it around the corners and the rear centre panel. 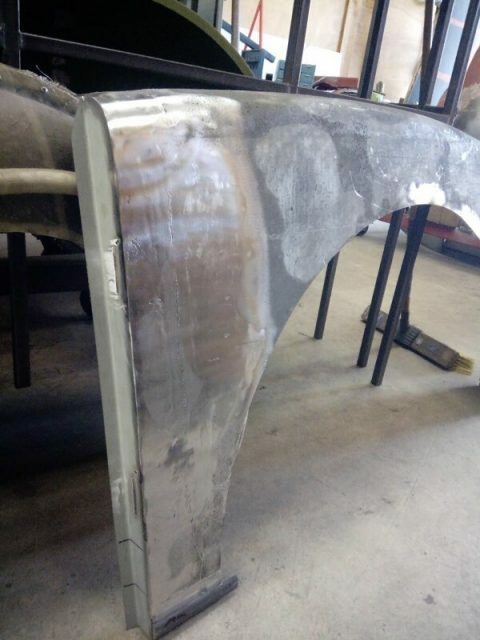 The trim has now been welded to the entire base of the tanker and looks absolutely superb. 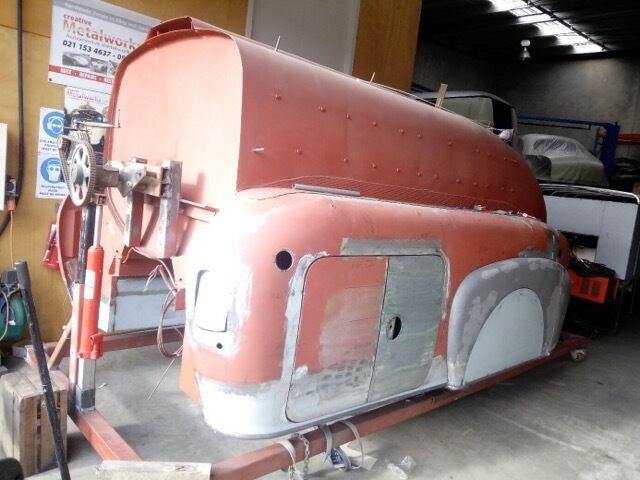 The rear bumper has been trial fitted by positioning it behind the tanker. 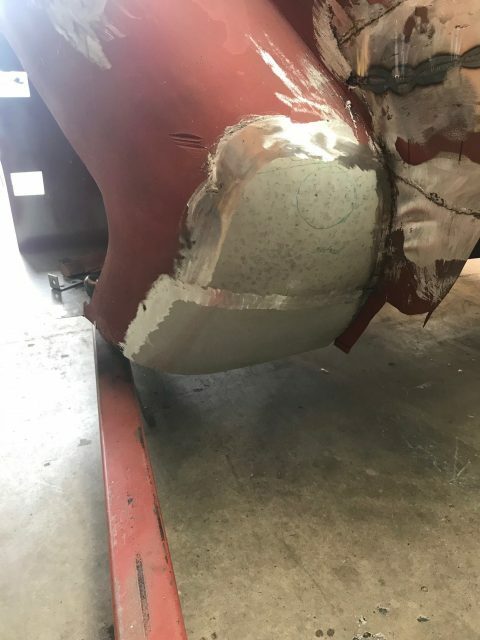 During this exercise, and as Simon has worked his way around the tanker, a number of minor differences in measurements and workmanship has been discovered between the two sides of the tanker. This is no surprise given the non-automated construction and the number of coach builders working on each of these builds. There were probably several workers on each side of the tanker, each having different skill sets and abilities. All the little flaws in this tanker are representative of the reality of coach building in this era. It is remarkable that the craftsmen achieved the near perfect accuracy and precision that they did when constructing these visual beauties. 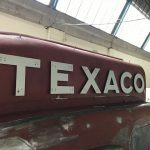 The following before and after photos show the amazing transformation of the tanker, and the talent and skill involved in getting it to this stage. 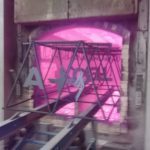 We are just in awe at the results achieved to date at Creative Metal Works. It is difficult to comprehend the sheer hard work involved in hammering and shaping the heavy 16 gauge steel, day in and day out. 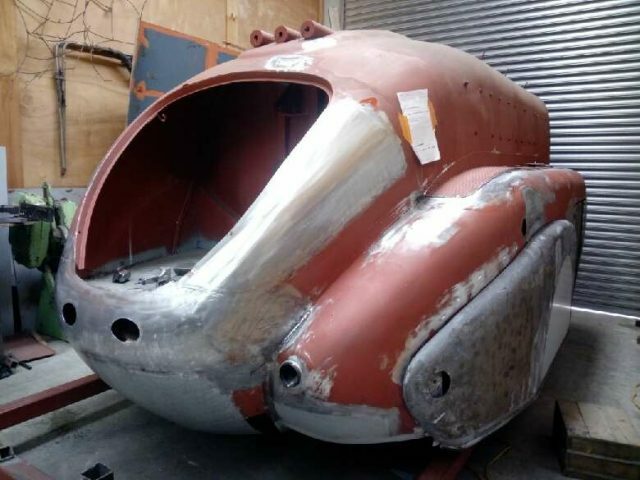 The gruelling repairs must be physically exhausting for Simon and Craig, so we are very appreciative of their ongoing dedication and perseverance to finish the tanker fabrication to such a high standard. They are almost there! Beautiful craftsmanship. So impressed by your work, and attention to detail. A painfully slow process I’m sure, but can’t wait to see the end result!! Thanks so much Jeffrey. Simon’s craftsmanship is world class. We are very fortunate. Amazing craftsmanship,stunning result and another excellent commentary . Thanks Richard. We are thrilled with how it is coming along. Thanks Ern. It will be great to catch up at Kumeu. Looks great Steve and Sue, what a transformation! Thanks Justin. It is looking amazing. A credit to all ,considering when it sat in our warehouse for months I never thought I see it back in its original glory. 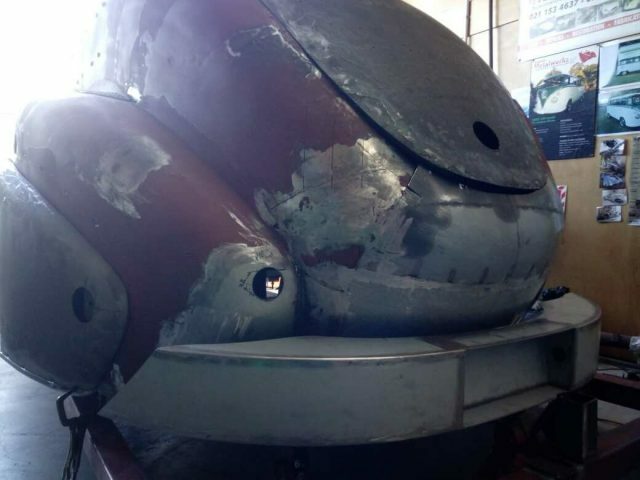 The rear “before” shot is the condition that the tanker would have been in when it arrived at your warehouse from SC. Such a transformation since then. Thanks Steve. Wow. The transformation photo’s show just how good these metal guys are.Unreal work with heavy metal. Congrat’s on the progress….. Thanks Craig. Their attention to detail on the fabrication is just amazing. This is a VERY WORTHY effort. 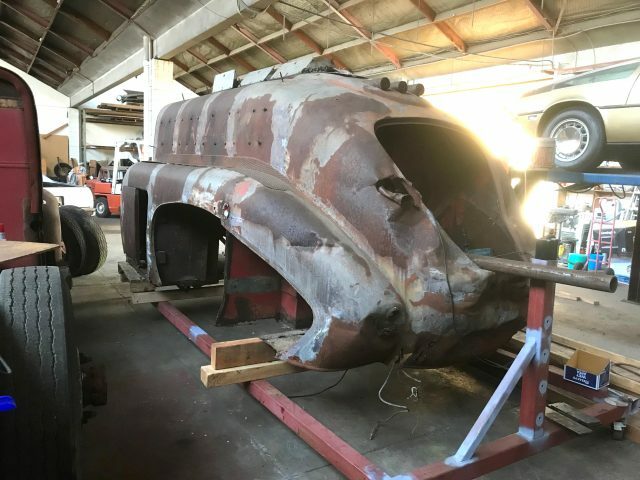 Can’t wait to see the finished truck. I have no doubt that the result of all this work will be a vehicle that is better than the original. great transformation between before and after photos,superb workmanship,look forward to the next update. Those last comparison photos are a great reminder of how far we have come in a relatively short time. We can’t praise the workmanship enough. Thanks Steve. Wonderful work and writing. I’m really enjoying this journey. Thank you for sharing. The work going into this build is simply phenomenal. 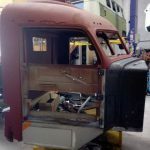 Loving all the behind the scenes photos – it’s hard to believe the before and after shots are of the same truck! The guys working on the bodywork are clearly very talented and obviously relish a challenge! I look forward to seeing the finished product. Thanks so much for your comments Tom. The guys at Creative Metal Works have done a terrific job. 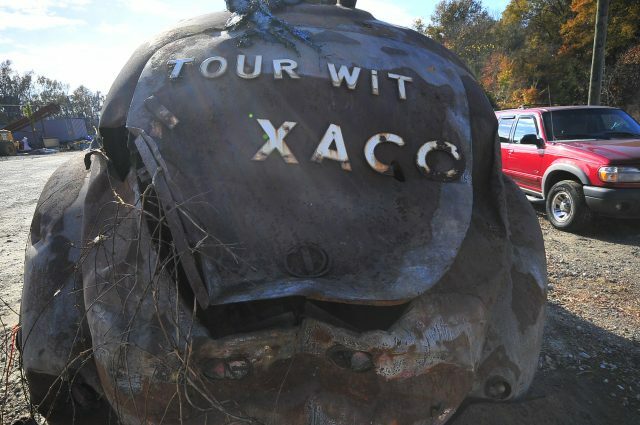 We are looking forward to seeing the same transformation with the cab. Thanks Brian. There are so many talented and clever craftsmen here.